I've mentioned this a few times in the past year but the last 12 months have been all about being fearless for me. I have lived so much of my life scared of what people thought, scared that I'd get hurt, scared that I'd regret something. Well, what I realized was the only thing I regretted was being afraid and saying no to things just because I didn't believe in myself. Isaiah 41:10 says, "So do not fear, for I am with you; do not be dismayed, for I am your God. I will strengthen you and help you; I will uphold you with my righteous right hand." That verse is a constant reminder that I am not doing anything alone. So the other day I did something I NEVER would have done a year ago. I met a stranger on the side of the road. This is Julia. 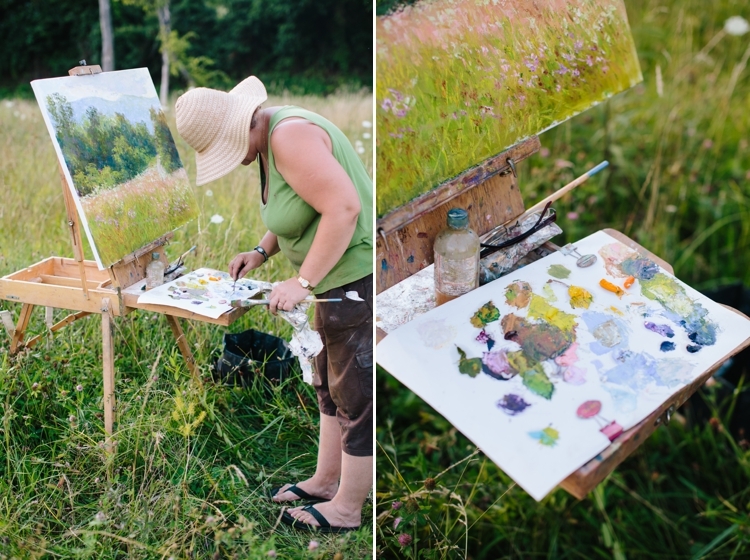 I had a shoot a couple weeks ago and on the way to one of our locations, I saw this lady painting out in a field. I thought it was the coolest thing but just continued on to my shoot. When we finished up, I was headed home, but when I passed her, I knew I had to go back. I turned my car around and parked on the side of the road. I got out and said hello, but she hesitantly said hello back. I explained that I loved what she was doing and asked her if she'd mind if I took a photo of her. 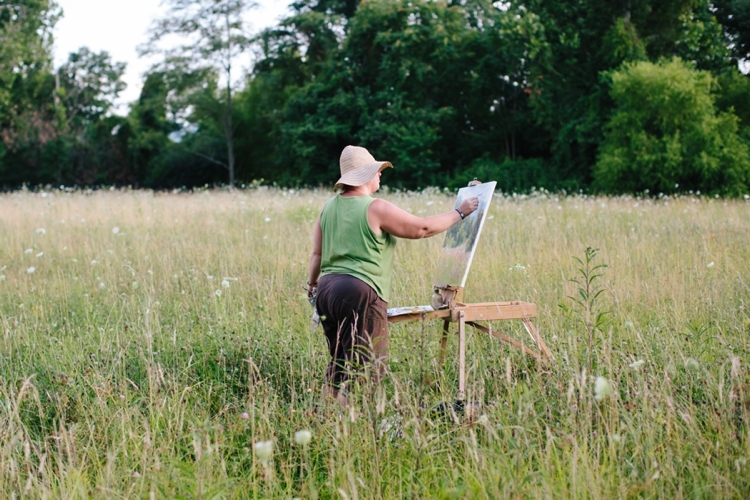 She said she was so relieved when that's all I wanted because earlier in the day when she was painting in a similar field down the road, someone had asked her to move. So ridiculous! Anyway, we started talking and she told me she was Russian and recently moved to Virginia a couple years ago. I asked her what brought her here and she said her son, around 16 at the time, had been drafted into the Russian army, which was their worst nightmare. She told me that a story had been leaked in 2012 where a man in the Russian army had been killed and sold for his organs. 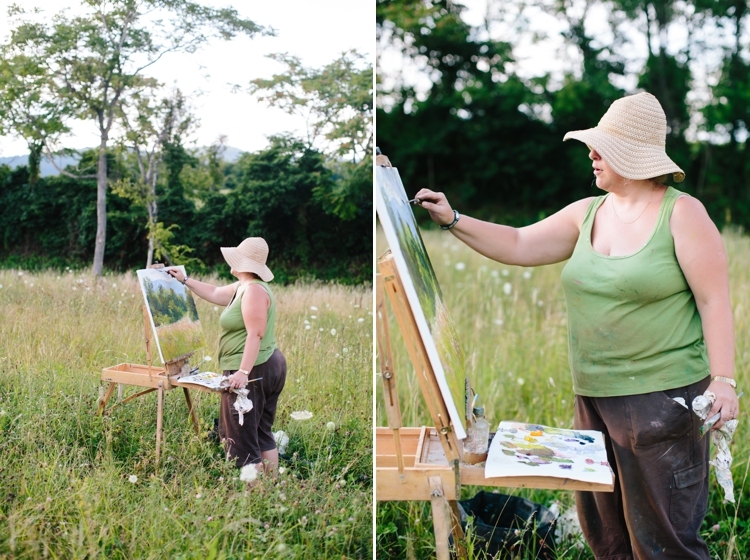 So in fear of what could happen, their family quickly moved here and Julia now spends her time painting the landscapes of VA. 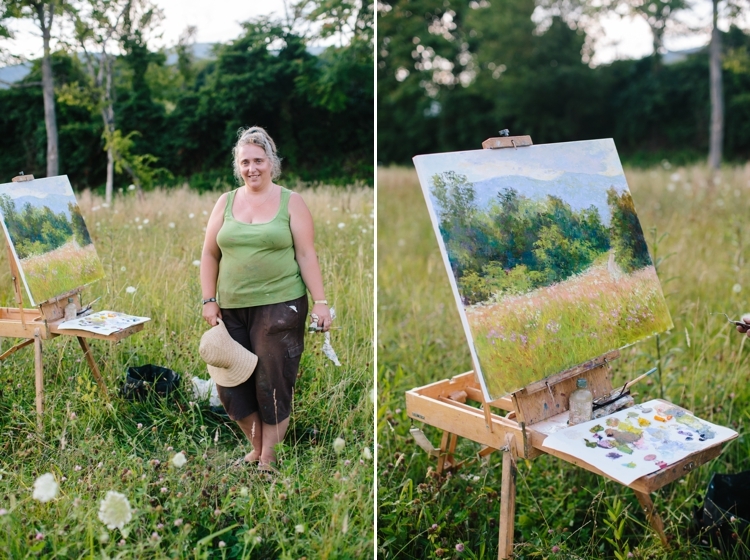 I asked her if she kept any of her paintings for herself and she went on to say, "If I can make someone happy with my paintings, I don't see why I'd want to hoard any of them." What a selfless way of looking at things. So today I'm thankful for learning from strangers, because everyone has a story and something to teach. Check out Julia's work here. gahh, my heart. i love this so much! and here painting is so stunning. we are new to this area (just moved to staunton, virginia) and i am wondering where exactly you are? this scenery is beautiful and i am always looking for places to sight see and drive by. would you mind sharing how to get here? your site popped up on my google search. Hey! This is in Crozet, VA! It's an awesome little town!